Combine water through pepper in a medium sized pot over medium-high heat. Bring to a rolling boil. Turn heat to low. Cover with a lid and simmer for 17 minutes. Turn heat off, and with the lid still on, let the rice steam an additional 5 minutes. 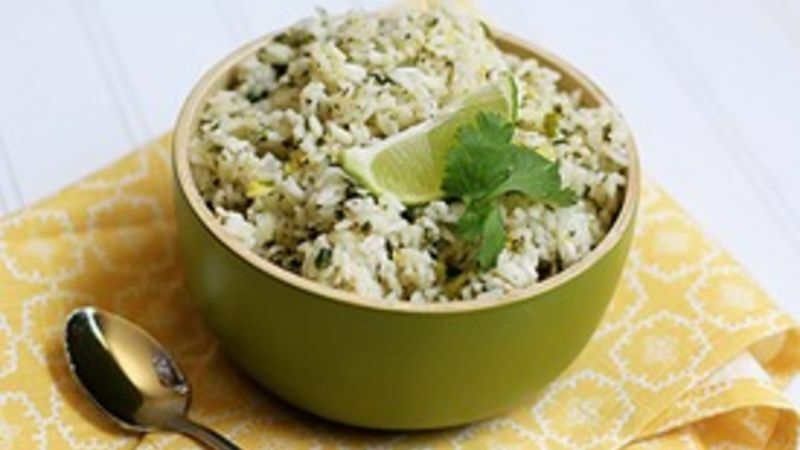 Remove the lid, fluff with a fork and stir in the lime zest, green onion, and cilantro. Serve. Cilantro is exotic, fun, and a little strange. So what is it exactly? And what makes it so great? It sounds kind of exotic. But, what is cilantro? Cilantro is actually a fresh herb used in Southwest and Mexican cooking. It's a unique herb – many studies show that about half of people who have tried cilantro find it delicious while the other half finds the taste soapy and the smell disgusting. Curiously enough, people of European descent will often fall in this second group even though cilantro is found natively in Southeast Europe. For those who can like it, cilantro is like a blend of caraway, lemon, and sage. Cilantro is found fresh in most grocery stores and is available year-round. When selecting your cilantro leaves, you should be on the lookout for tender and aromatic leaves that are very green. Avoid wilted bunches and leaves without a strong smell. No aroma when you pinch the leaves mean the cilantro will have no flavor – and what's the point of that? Storing cilantro is a lot like storing parsley – keep it in an airtight container or wrapped in a bag and use it or lose it within a week (or less). You may also find dried cilantro in the spice rack, but the flavor doesn't hold up very well, if at all. Cilantro is an herb that everyone should try at least once—experiment with it to help brighten up a salad or add a rich and flavorful taste to cooked meats. Turn that fresh bundle of cilantro into these delicious recipes.